Today is Valentine’s day, a day that celebrates love. To stay festive, I am celebrating my LOVE for dumplings. 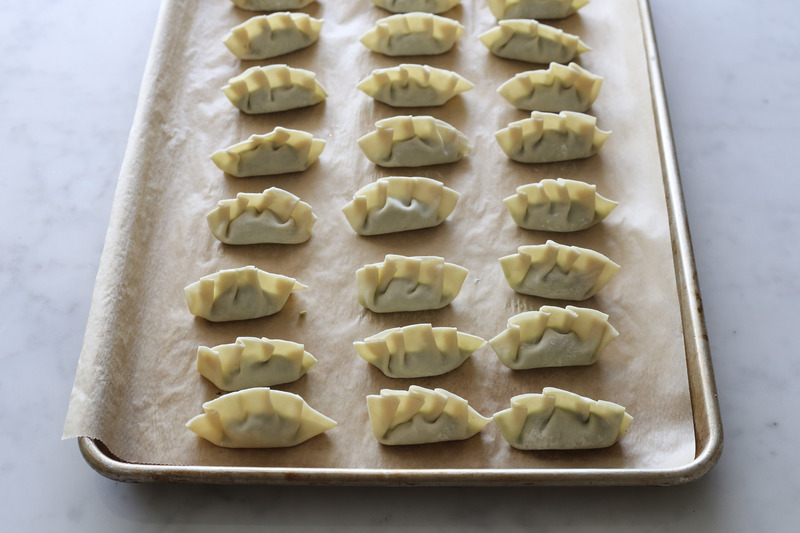 There are so many varieties of dumplings, think pierogis, kreplach, momos, and gyoza. My recipe is influenced by Chinese style dumplings that are made with a thin wheat based wrapper, boiled and served with chili oil. 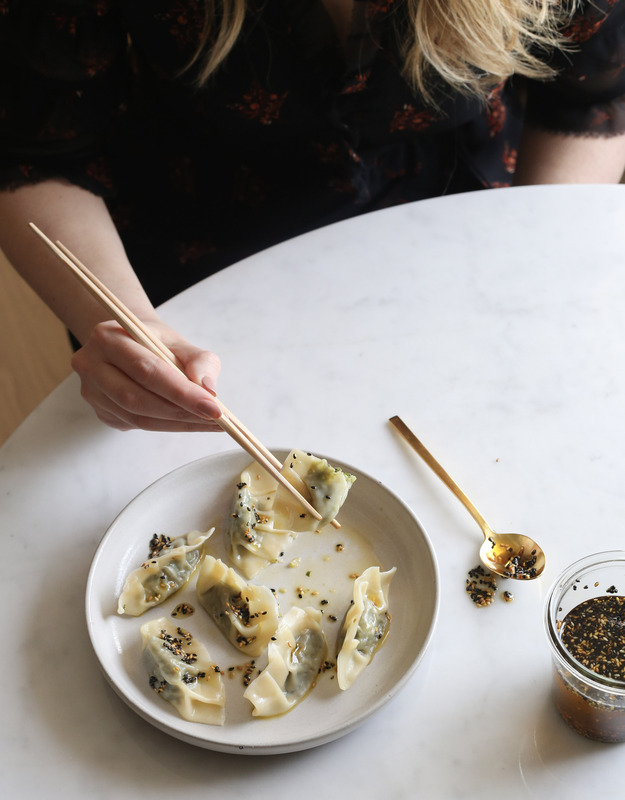 Nonetheless, my recipe for Green Dumplings with Garlicky Sesame Chili Oil is one of a kind, thin parcels full of delicious vegetables and tons of flavour. Not everyone knows how easy dumplings are to make at home. The hardest part is often making the dumpling dough. Fortunately, this recipe calls for store-bought wheat dumpling wrappers, which wipes out a lot of your prep time. Most grocery stores carry dumpling wrappers in the fridge section. If not, head to an Asian grocer. The best part of this recipe is that the filling is made in a food processor. I love throwing ingredients in a food processor and having the machine do the work. Also, these dumplings are boiled which is the easiest cooking method if you ask me. So, there you have it. 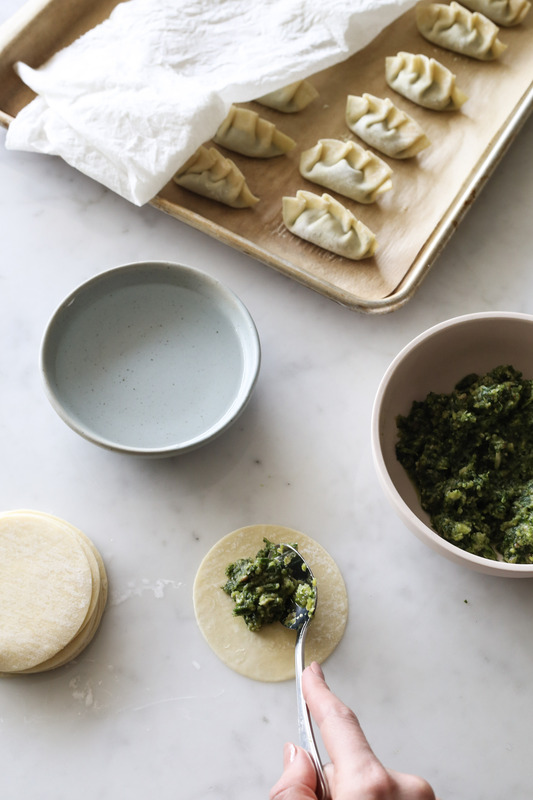 Dumplings are easy to make and fun to eat. Don’t skip the Garlicky Sesame Chili Oil. The dumplings taste even more fantastic with a punch of its heat. Make sure to keep the extra oil because it’s quite versatile. You can serve it with noodles or fresh bread, use in salad dressing, or even fry an egg with it. The possibilities are endless. Once you open the package of dumpling wrappers cover them with a damp paper towel to make sure they do not dry out before using. If the wrappers are dry they are more prone to cracking. Cover prepared dumplings with wet paper towel before they are boiled so they do not dry out. Make sure you tightly seal the dumplings. If there are any holes the filling will fall out when dumplings are boiling. P.S. I would like to shout out to my sister for hand modelling. I can always count on her for fresh nails. In a food processor, process the garlic, ginger, and leeks until finely chopped and almost a paste. Add the zucchini and kale and process until finely chopped. Add the mushrooms and chives* but be sure not to over-process, you want texture from the mushrooms. Stir in the salt. Mixture can be made a day in advance. Drain extra liquid before using. *If food processor is full remove some of the filling before adding the mushrooms and chives. Stir back together all of the filling at the end. Line a baking sheet with parchment paper and fill a small bowl with water. Place 1 heaping tsp of filling in the middle of the dumpling wrapper. Wet the edges of the wrapper with your finger. Fold the circle in half and seal the wrapper. You can either pinch the two sides together or pinch and then create folds. Place garlic, chili flakes, and olive oil in a small pot. Bring to a simmer over low heat and cook until garlic begins to golden. Remove from heat and allow to sit for 2 hours. Strain and whisk in toasted sesame oil and sesame seeds. Use immediately or refrigerate until ready to use (bring to room temperature before use). This entry was posted in Starters/Sides and tagged boiled, chili oil, chinese, dumplings, farmers market, Vegetarian. Bookmark the permalink.